Anyway, there is always a motivation behind the kiss. Just as a good novel flows from a character’s motivation, kissing is the result of someone’s inner desire. So, what are some motivations behind a kiss? Well, we’d hope the most important one would be love, but that’s not the only one. (I like to think an example of this one is from Gaskell’s North & South. Whatever the motivator, a kiss is the result of an overwhelming ‘need’ to make a physical connection, touch. It can be a gradual shift, like a friendship blooming to romance (Think Anne of Green Gables) or it can be a fast-paced desire (maybe like How to Lose a Guy in 10 Days-ish). Either way, there is a force that pulls one person’s lips to the other person, with a force to rival magnetic energy. So… what are some reasons you might list as motivators for a kiss? Now, Laura, what do you think makes a good kissing scene? 1.Hmmm…what makes a good kissing scene? Good question! First, every meeting that leads up to that first kiss should simply sizzle with romantic tension. There must be *sparks* long before that first embrace. You need to hear the reader cheering in the background for the hero and heroine to come together. Then, pour on all the sensory details you can – scent, taste, touch, sight, etc. Contrast their differences. My upcoming hero is a distillation of leather and the outdoors and my heroine of lavender water. He’s tall and hard as granite beneath her hands, she’s small and has the feel of silk. Little details like these bring the scene to life. The reader should experience that kiss right along with the fictional couple. She heard the waterfalls before she felt their mist. Catching hands, they tumbled together over a gentle falls, coming to rest beneath a rock overhang out of the way of the rushing water. She looked around in wonderment, the thunderous spray hemming them in on all sides, making speech impossible. But truly, words were unnecessary. Gently, he framed her face with his hands. Her lips parted as she looked up at him, expectant, drinking in every line and shadow of his striking face. She was trembling now, not from the chill of the water but from his nearness. The sweet ache he created inside her drew her against him, and she flung her arms around his neck. He began covering her with kisses, on her open mouth, her neck, her hair. She kissed him back, stunned by her need of him, her hands tangled in his wet hair. Gone were the careful kisses of her girlhood, given her by Simon. 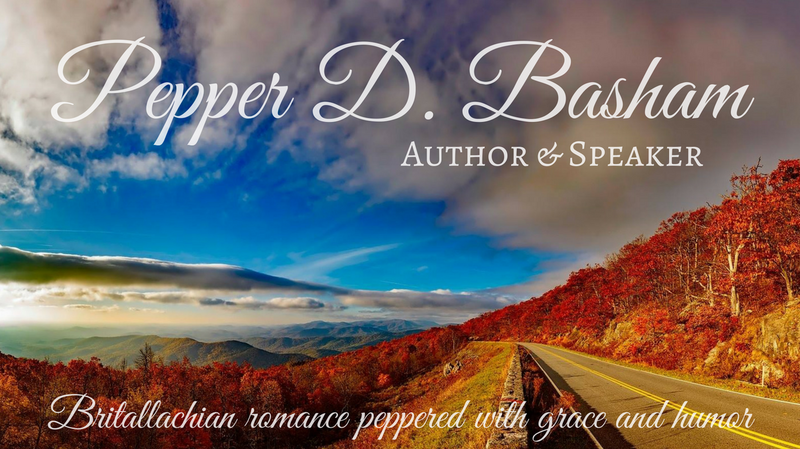 This was a wild, possessive declaration of a passion too long denied, sparked years before when he called her out of her cabin, then lay banked and smoldering while at Briar Hill, only to blaze up here and now. His raw strength took her breath away as he held her, but it was his restraint that won her heart. He drew back slowly and removed a silver bracelet from his arm and put it around her own, then took her hand and led her over rocks and rushing water back to the bank. Silently, they walked hand in hand back to the great slab or rock that held his weapons and moccasins, and he helped her with her discarded dress. She was shivering now in her sodden shift, and the dry dress had to be tugged into place over it. But before she could tie her bodice strings, she was in his arms again, touching him and trading his kisses and being touched and tasted in return. Well, I must say you definitely have the ‘spark’s’ flying on this scene, Laura. Sizzling, in fact. I can just imagine the steam coming off of those bodies in that waterfall. Gracious! This scene is one of those ‘surprises’ in a book. It snuck up on me, just like an unexpected kiss J Thanks for being a part of this, Laura. May God continue to bless your writing. No love is greater than God’s. In this Psalm of David, he is crying out “Where is God?” Throughout the psalm David keeps reminding himself that God is with him. God loves him. His faith is more than an emotional response, it is a choice. So is love. Many times as writers, we fill our scenes with the emotions involved in ‘romance’, and that’s fine, but in the end real love comes down to a choice. And love of Biblical proportions came down to Jesus on a cross…by choice. “Not my will but yours be done”, he’d prayed to his father God. In the end the choice to love, love with his life, came with a resounding YES. And so, we are called to love. To choose to love. *SIGH* That was so lovely! And NO words were shared in that scene, which really amazed me! Nicely done! My favorite part was “but it was his restraint that won her heart”. What is it about a man who can surrender his own desires for his lady. He can hold himself in check in order to protect and cherish his woman. Sigh…I love it! And Pepper, I’m ready for the next round of kisses!!! This has been such a great series. Thank you for sharing! And that ice skating picture…is that from a movie? Or a stock photo? That picture is from the movie Serendipity. Hello Sherrinda, Renee, and Pepper! It’s such a treat to wake up (I’m on the west coast so the time element always throws me) and see that the party has started:) I so appreciate your comments and this has been such an outstanding series!! Pepper has oodles of creativity and writes so beautifully. And the pics, quotes, and Scripture are just great! You are so good at always pointing us back to Him no matter what we are discussing. Will check back in later today:) Oh, and I just wanted to mention that my upcoming novel, Courting Morrow Little, will be in the winner’s hands in June, a month ahead of the July release date. I know that’s a little while to wait but I never forget a winner and I pray it’s worth the wait! Bless you all! That was beautiful. Oh sighhhhhh……………… 😀 Seriously, a water fall? That is absolutely to die for romantic! I need to get my hands on your book! I absolutely ADORE your book covers, just stunning is the only word for them! Okay, see? 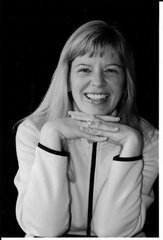 Today’s blog is living, breathing (oh, DEFINITELY breathing) proof of why I think Laura Frantz is one of the best historical romance writers out there today. Whew!! Good thing this scene was in water or the the page would have been burned to a crisp. And Sherrinda, Renee and Pepper … Laura is my guest on Seekerville next Wed., so be sure to stop by as she has a book giveaway then too! I look forward to winning or buying Courting Morrow Little. Can’t wait. I’m with you! The covers of Laura’s books are fantastic. Courting Morrow LIttle is just lovely. The picture is stunning. I can’t wait until CML is out. Casey and Julie, Bless you for your comments! Chuckling at that sizzling waterfall scene and those crispy pages. That’s what I love about Julie – her unbridled enthusiasm for everything!! I tend to be an exclamation type person myself if you couldn’t tell:)! I posted Julie’s book cover this week on my blog but didn’t tell her about it so will mention it here though I know you all have already shared the joy:) I’m wondering if Julie knows who any of her cover girls are? I don’t know who Lael was for TFD, nor Morrow for CML but would love to. Hard to believe these girls are walking around out there somewhere, sans the period clothing! I really believe that Revell has, in my humble opinion, the best art team in the CBA. I was thrilled when the art director and designer sent me actual photos of 18th-century gowns from a costume shop to choose from. I picked this raspberry silk gown because of the stunning color and also the beautiful lace collar or kerchief. So thanks to all of you who are commenting on that. It really is the cover of my heart! Oh, oh, oh! And I’m pleased beyond measure to be a guest of Julie’s at Seekerville next week like she mentioned. I hope I see you all over there! We’ll be giving away a copy of The Frontiersman’s Daughter this time. Bless you bunches! Whoops forgot to leave my email on my first post! 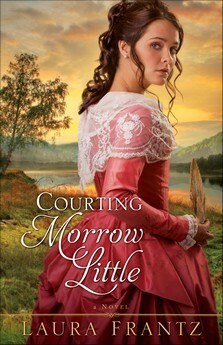 I definitely want to be entered to win Courting Morrow Little! Hey, Laura, no question about Revell having a fabulous art team, that’s for sure! Is your artist Cheryl Van Andel, by the way? And, YES, I actually have heard from one of my cover models (calm down, Pepper, Sherrinda, Renee and Casey, it wasn’t Collin!!). The model who posed for Faith e-mailed me right after the A Passion Most Pure released, and guess what? She’s an Irish Catholic girl named Mary (forgot her last name and lost my e-mails a while back, so no record of her surname, but it was VERY Irish!). I remember joking with her that she did a good job because the book was selling like hotcakes (and it was at the time, although with everything, things DO slow down … :)), and I was tickled to hear back from her that her boyfriend had started calling her “Hotcakes” as a result. Isn’t that a cute story? What a fantastic post! The longing, the suppressed desire, all realized in that waterfall kissing scene. It snuck up on me in the book, too, and I think that contributed to the power of the scene. It is beautiful and was very gratifying to read as it brought so much together in the story and also added to the remainder of the story in a profound way. It wasn’t just a kissing scene. It mattered. Laura is an amazing writer and I highly recommend her! Hi, Laura! How wonderful to see both of your beautiful book covers on Pepper’s blog site! Hard to believe that it will soon be time for “Courting Morrow Little”! Oh, it’s wonderful to see Carla and Heather and Virginia on here! Each of them hold a special place in my heart as they’ve been cheering me on and encouraging me with their friendship:) That means more to an author than you can imagine. Julie, how neat that you actually were contacted by one of your cover girls! I would love that – or even to think that they took time to read your book:) And yes, Cheryl is the one who does my covers – Dan Thornberg, too, who I think had a hand in yours. When I first saw A Passion Most Pure (which is still sitting on my desk BTW) I was so amazed by how beautifully done it was. And I got so tickled when you did a bosom enhancement on your second:) I wanted that for Morrow as she looks a little flat to me, then remembered she has on stays! Anyway, every one of your comments bless me abundantly. I pray my books bring you joy and move you closer to Him.